In this edition of Staff Features, we catch up with one of our most dedicated and motivated team members! 1. What is your earliest or fondest memory at Sun Country? I have many amazing memories at Sun Country, but one of my fondest was when my fiancé proposed to me! 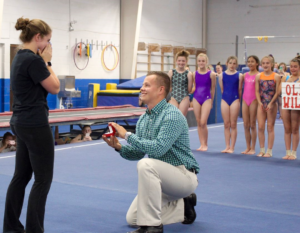 He had all my athletes in on the proposal and having them be a part of my big surprise honestly made my life. I spend so many hours a week with those girls, and they have been asking me daily for the past year when a proposal was going to happen. They are a huge part of my life, so having them be there for a major milestone meant the world to me. They all rushed me with hugs and happy tears after I said YES! 2. Where is your favorite place to be? On the water… preferably the ocean and on a boat or the beach. This girl loves to fish! 3. If you were a type of food, what food would you be? Sushi. I’m surprised I haven’t turned into it yet based on how often I eat it! 4. What do you find most challenging about your work? I would say my age is the most challenging aspect of my job. I have had difficulties working with both athletes and parents not fully trusting my advice or opinion because I’m so young. While I can understand where they may be coming from, it does make me feel like I wasn’t given a chance. I wish people got to know more about me and my experiences in the gymnastics world and in life, so they could understand my goals and motivations. 5. What do you enjoy doing when you’re not working? I enjoy spending time with my family and taking my pups on adventures. 6. What do you think about the evolution of gymnastics over the next 5 years? I’m really excited to see what Tom Forester can do for USA gymnastics. I’m very lucky to be involved in the TOPS program and have had the opportunity to work with the National Team staff. The national team staff members are amazing, and it’s an honor to get to learn from them. I’m looking forward to staying involved with these opportunities! 7. What is the weirdest job you’ve ever had? My first real job at 13 years old was doing bookkeeping and accounting for my grandparent’s auto shop. It wasn’t necessarily a weird job, but definitely odd for a 13-year-old to be handling that kind of job. I am thankful that my family allowed me to learn that though, because it taught me a lot about handling money and how to save/spend it. 8. What does true leadership mean to you? Leadership is based on a person’s qualities of contribution, success, motivation and support. A leader makes the work environment a welcoming and enjoyable place. They contribute just as much or more of their time to those who they are leading. They motivate you to work hard and be a better employee, but also understand that people have personal lives outside of their job. They allow you to learn on your own, but also guide and mentor you to be a better person. Finally, a leader leads by example every day and makes sure that you feel as appreciated and wanted as possible. They lead you only to success, but if they happen to fail they accept responsibility and would do anything for you. I’m thankful to know many leaders, but the person who has shaped me the most at Sun Country would be my coworker and department leader, Mary Carlson. She is this exact definition of leadership and I strive to be more like this every day! 9. What might someone be surprised to know about you? I have a passion for diesel trucks! My fiancé does as well, and this is a hobby we share together. We like to find hidden gems, fix them up and then resell them. I’ve learned a lot about the mechanics of trucks through my fiancé, and I’m excited to keep working on our current project – an LB7 Duramax. 10. 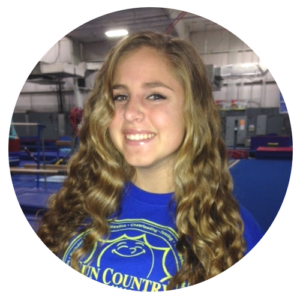 What do you enjoy most as a gymnastics coach? I enjoy making unbreakable bonds and amazing memories with my athletes. I love watching them grow in gymnastics, and outside of the gym as well. I try to support my athletes as much as possible and teach them important life lessons through gymnastics. You’d be surprised how many things in life can relate to this sport!! With my Pre-Occupational Therapy and child development background, I’m able to better explain to them the stage of life they are in and how their brain, emotions, thinking, etc is changing and growing daily. I just love to help my kids and make an impact on their life! A big thank you to Olivia for taking the time to answer our questions! If you ever happen to see her around the gym, feel free to share a smile and say hello. We hope to see you back again next month as we continue learning more about our hard-working Sun Country Staff!